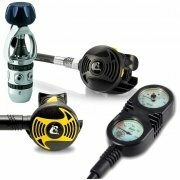 Diving regulators are an essential piece of diving equipment that is designed for life support and must be maintain and serviced in accordance with the manufactures guidelines. Generally annual servicing is recommended however, if your regulator is used frequently or has heavy use then it may require an intermediate service to ensure that it performs to its specifications. 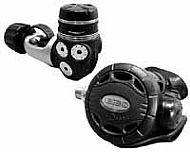 All makes and models of regulators are serviced in accordance with the manufacturer’s guidelines and serviced using the correct service parts and tools. A warranty of 3 months is provided from the date serviced provided that the equipment is used and maintained correctly and shows no tampering by the owner. The proper preparation of diving regulaors for use with Enriched Air Nitrox (Nitrox) is essential for the safety of the diver. All regulators requiring O2 cleaned are O2 cleaned using Biox '02' cleaning fluid which is used by the Ministry of Defence, Military Establishments, Off Shore and Diving schools Worldwide for the cleaning of their oxygenated breathing systems and hyperbaric equipment. IMPORTANT NOTE - Please note that prices quoted for servicing listed above, cover labour charges only. Brand-specific service kits and/or replacement parts are charged as extra.